On the strikingly beautiful southeastern coast of the Spanish island of Mallorca there’s a tiny beach that’s as close to paradise as any of us will ever get. 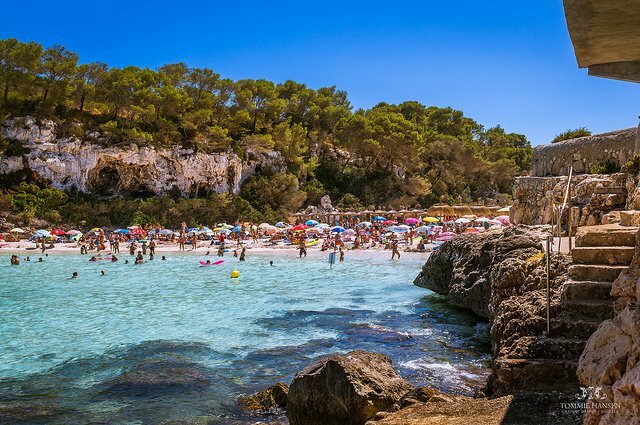 The name of the beach is Caló des Moro, and it’s nestled in a rocky cove surrounded by pine-covered limestone cliffs. The incredible natural beauty of Mallorca has made it one of Europe’s finest tourist destinations. 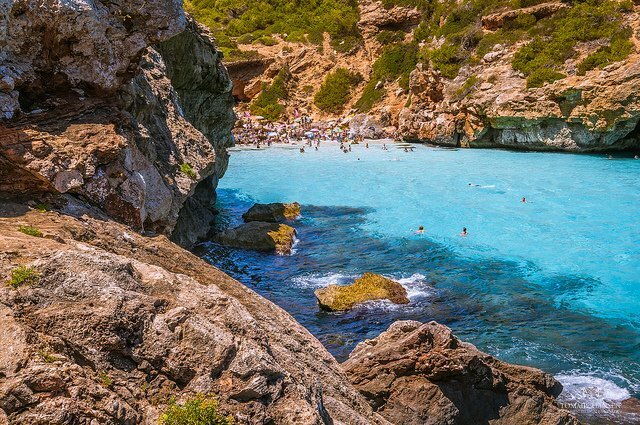 The Mediterranean Sea here is crystal-clear, brilliantly blue and perfect for swimming and diving. The island is full of little inlets all along its shores, where boats can drop anchor in remote spots inaccessible to cars. And the beaches? They’re among the prettiest in the world — and a lot less crowded than most of the popular Mediterranean destinations. Except for Caló des Moro. 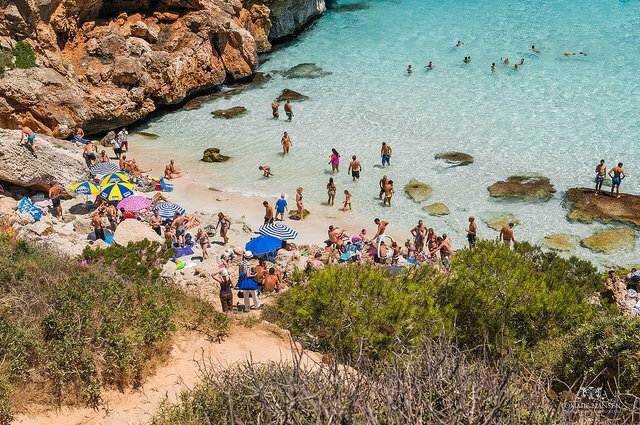 That’s not to say that crowds flock to this perfect little beach. It simply doesn’t take many people to make it feel full. The tiny beach is less than 100 feet long, about 65 feet wide, and surrounded by rocks and boulders. There’s just not a lot of space for your towel, even when you’re one of only a few sunbathers. 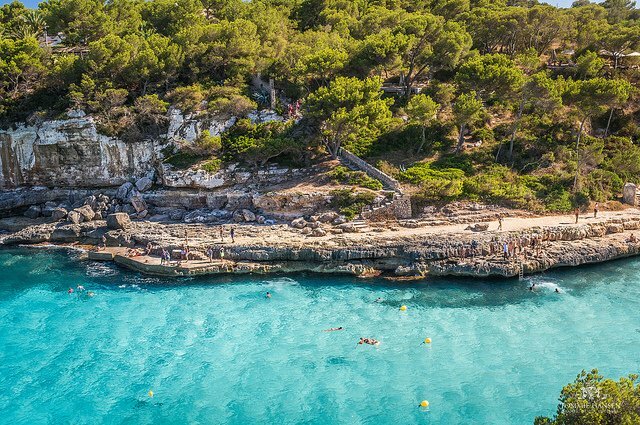 So get to Caló des Moro early in the day, and stake out your claim to a few feet of this phenomenal location. It’s just a short trip from the small resort of Cala Santanyi, which is a lovely place too, by the way. Drive from Cala Santanyi to sa Comuna, where you can park free. Then walk about a quarter mile down a trail — be careful, it’s pretty steep and rocky — until you arrive at your own little piece of paradise. 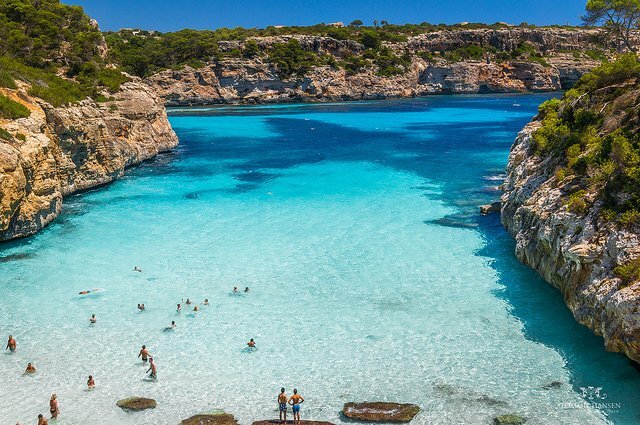 When you get tired of splashing around in the sapphire waters (doubtful, but possible), take advantage of the abundant riches the island of Mallorca has to offer. Mallorca has been experiencing a bit of a cultural Renaissance — local wines and local recipes from Nonna’s kitchen are the pride of Mallorcan restaurants. Old country estates have re-emerged as comfortably sophisticated rural retreats. The interior of the island is filled with almond and carob groves, vineyards, and the ever-present olive trees. Every inch of this place is worth exploring, and you can explore to your heart’s content. There are hiking and bike trails everywhere, and if you have the time, you can hike for days in the Serra de Tramuntana, Mallorca’s beautiful World Heritage Site mountain range. 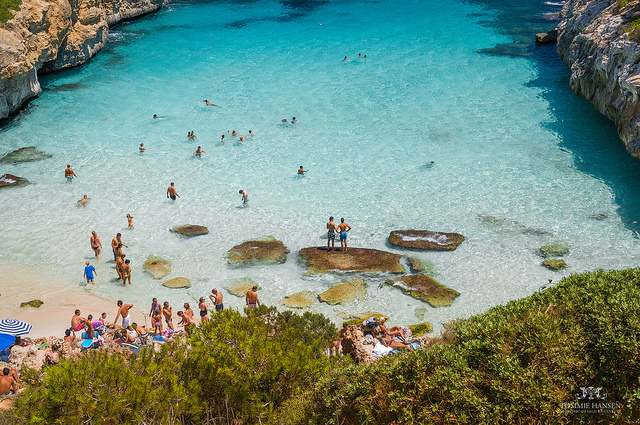 Mallorca’s charms are undeniable. 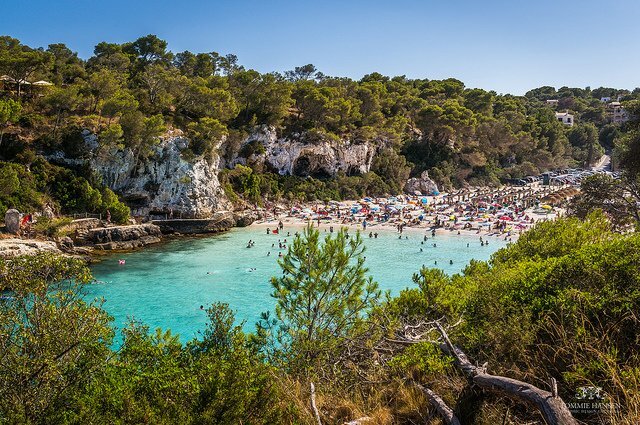 But if Caló des Moro Beach is your first stop, you might not want to go anywhere else — and that includes home.